Etsy just posted their How-Tuesday video recently filmed in my studio! 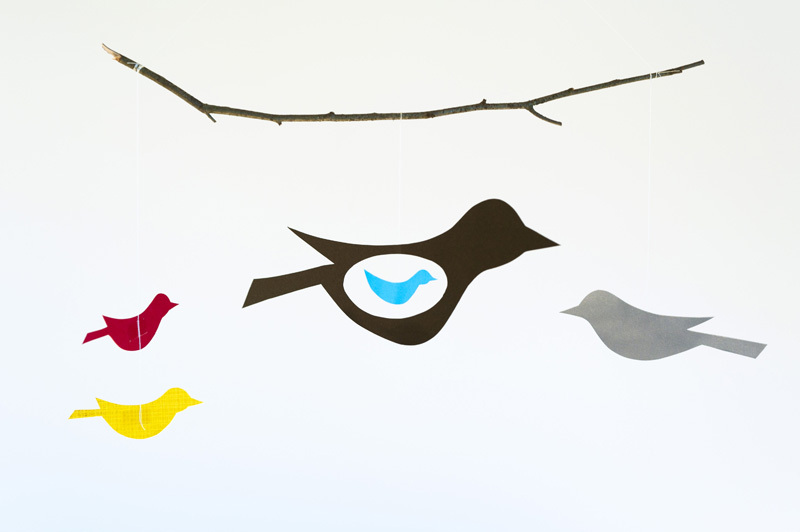 We made a Paper Bird Mobile that works nicely as a Mother’s Day present. I’ll attach the template below, but you can view the entire Etsy post and more info here. Thanks, Etsy! 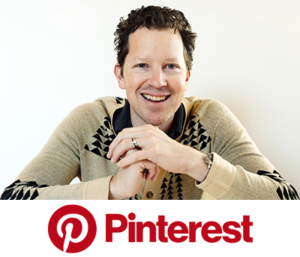 “This week’s Etsy how-to unfolds in the Portland, Oregon studio of Joel Henriques of Made by Joel, one of the coolest dads I’ve ever had the chance to meet. An artist, illustrator, painter, and boundless blogger, Joel is a pro at coming up with projects that parents can make and kids will dig. His upcoming book, Made to Play, is due on the shelves in October, 2011. A lot of folks here in the office swooned over the modern take on the retro design of his Owl Mobile, but I wanted something that folks could customize – according to their own taste or the number of kids in their brood. what a lovely diy and video! Mothers Day? Put a bird on it! I didn't notice until you referred to them as "Mamma Bird" and "Baby Bird" but The negative space is an EGG!! Clever. LOL - put a bird on it indeed! I'm still laughing. I love this. I also love the owl mobile back in the archives. It's very clever and sweet. Way to go Joel! I can't get enough of the awesome projects you do. Thanks everybody! Ha, yeah, we actually hinted towards the "put a bird on it!" while filming the video, but it didn't make the final edit. What can we say, there are a LOT of birds in Portland. We can't help it! :) PJ - Yes, glad you noticed the egg shape! I thought it would be appropriate design. Once again, your design projects have such a simple elegance. Just love this mobile. Oh I think I'll try that in class! I'll show you as soon as budding artists have done it! Thanks so much everyone! nerea - Wow, that's such a fabulous idea! 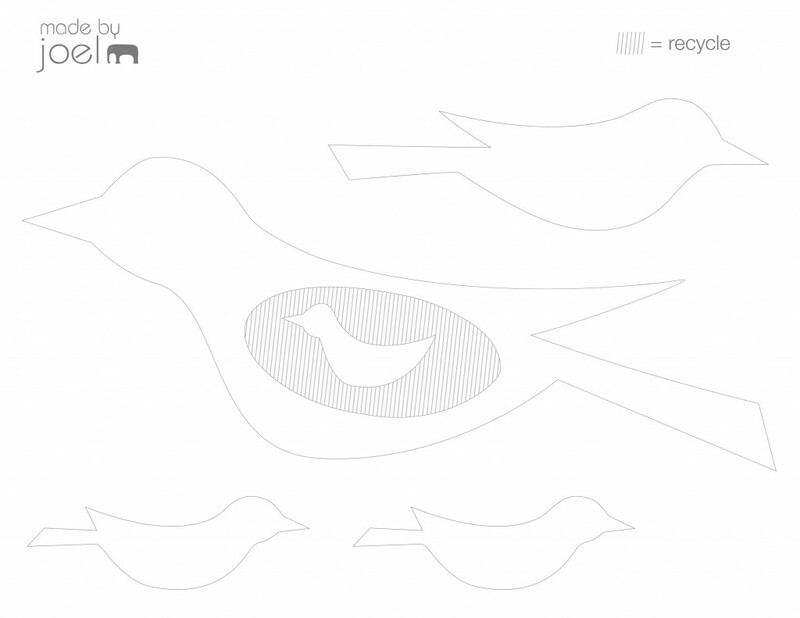 Now I've got to try making a bird brooch for my wife! Beautiful. Thanks for sharing! Thanks nerea! Very kind offer! I'll definitely take a photo when I make one! What a simple/fun project! Love it. Joel, I've heard people talk about your work, but I'm only seeing it now. It makes me wish I had grandchildren nearby. Would you mind writing a letter to my son and suggesting he move back from Manhattan? I'm itching for a chance to make toys for forgiving family--I'm all thumbs. It is simple yet fantastic. I love the bird mobile and I would love to make one, it looks so fun and easy to make! Thanks for sharing. I am having a hard time getting the mobile to print. It comes out too big. Any ideas? Love the book! WOW! That is amazing! A great DIY project! Am going to try it right now! Just made this mobile for my daughter's room. Thank you for the tutorial and template! Wondering how to post a picture?